Instant Pot Country Style Ribs are super delicious and easy to make. 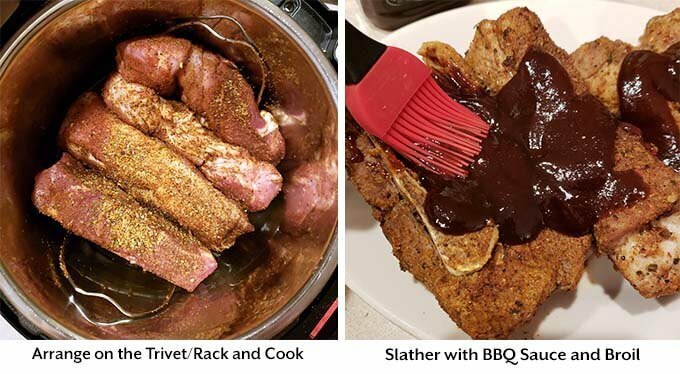 You will get fork tender meat flavored with a tasty spice rub, and finished with tangy barbecue sauce. Pressure cooker country style pork ribs are a great weeknight meal that is ready in under an hour! We have a pretty busy schedule. The guys work all day out of the house, and I work in the house. Because of what I do, I may not have a dinner idea planned out. I might not have enough time to cook a more elaborate meal if a photo shoot went too long, or if I had to remake a recipe. This is a full time job! 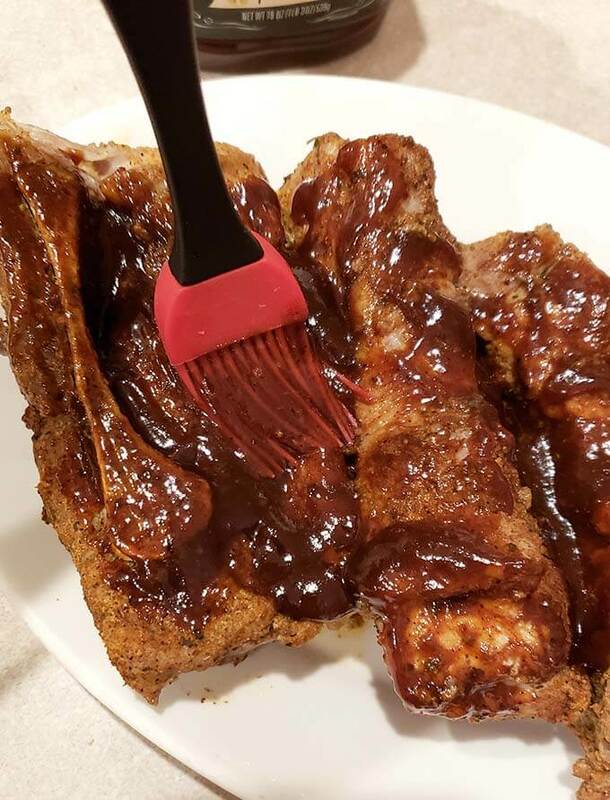 On the busiest of days I know that my Instant Pot® will be my tool of choice to make a recipe, such as these Instant Pot Country Style Ribs, in under an hour. For this recipe you can use either boneless or bone-in country style ribs. It’s the same cook time. You will want to season them really well with a spice rub, such as my Ribs Spice Rub recipe. This rub is delicious on pork ribs and is easy to mix together. The liquid in the pot can be water, beer, or juice. 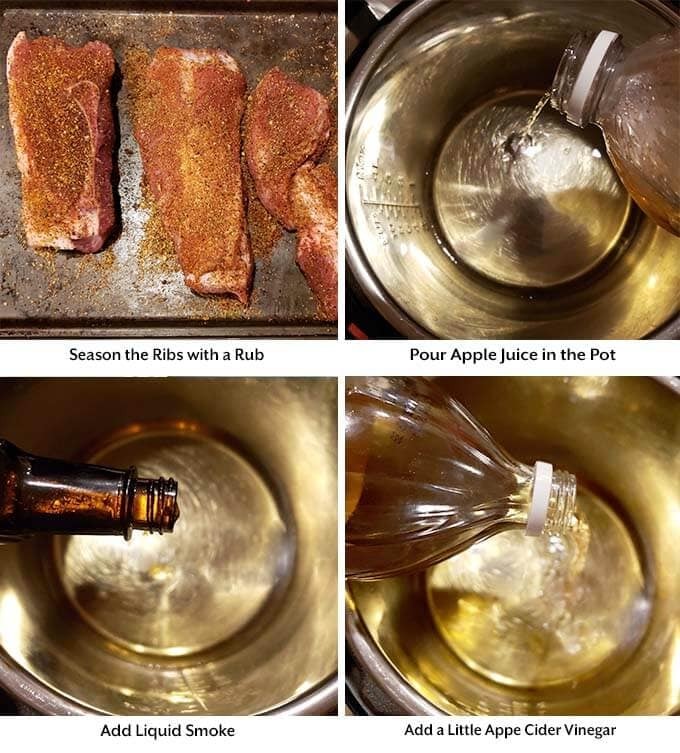 I prefer apple juice jazzed up with some liquid smoke and a little apple cider vinegar (ACV). You can’t taste it in the ribs, especially after they are slathered with bbq sauce. It adds a nice fragrant note that we really like. If you don’t have any ACV, or don’t want to use it, it’s fine to omit it. You will need a good barbecue sauce. I don’t make homemade very often because I have a favorite brand that has a nice smoky flavor that we all love. Just use your favorite! The last step after coating the ribs with barbecue sauce is to broil them. This is an optional step. 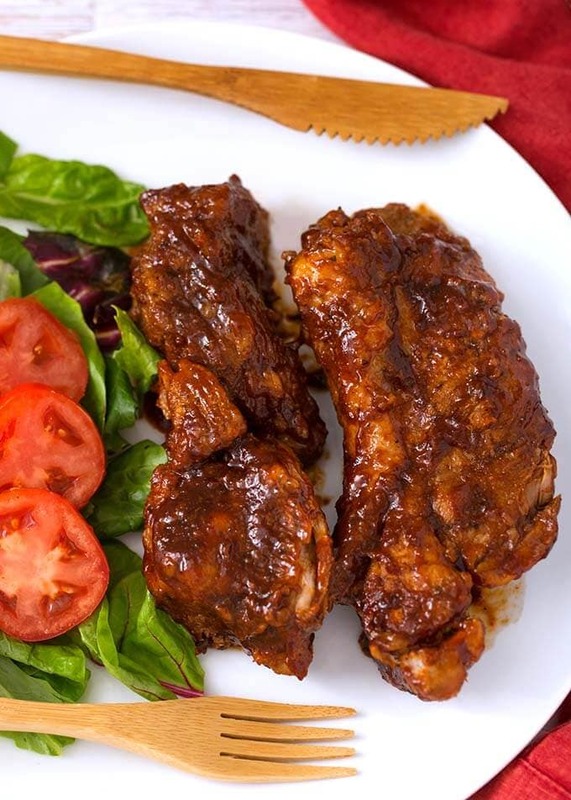 Broiling the ribs with the barbecue sauce on them caramelizes the sauce and enhances the flavor. Be watchful when the ribs are under the broiler as they can burn easily! 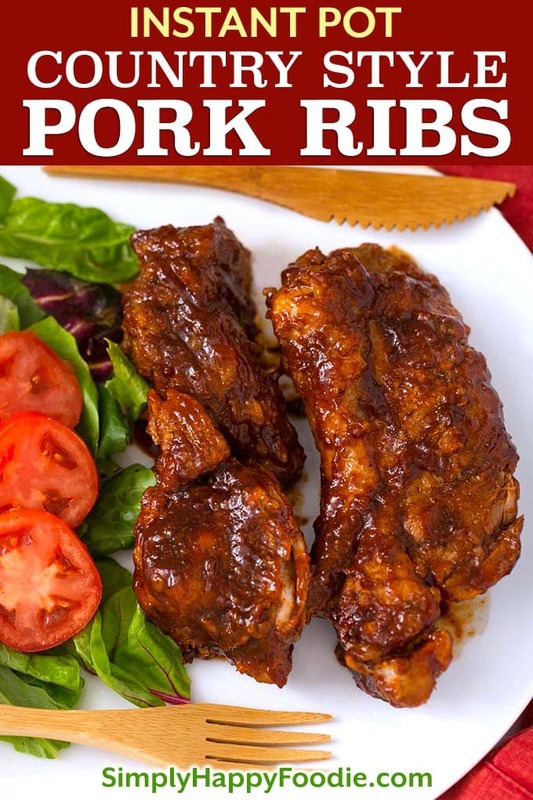 Instant Pot Country Style Ribs are delicious and easy to make. 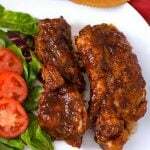 You will get fork tender meat that is flavored with a spice rub, and finished with tangy barbecue sauce. Pressure cooker country style pork ribs are a great weeknight meal that is ready in under an hour! Rub the ribs with the spice rub on all sides. Let the ribs sit while you prepare the pressure cooker. Add the apple juice, liquid smoke, and apple cider vinegar to the inner liner pot of the pressure cooker. Place the metal trivet/rack in the pot. Place the ribs on the trivet, trying not to overlap by much. Place the lid on the pot and set the steam release knob to the Sealing position. Then press the Pressure Cook/Manual button or dial, then the +/- button or dial to select 25 minutes. When the cook time is finished, let the pot sit undisturbed for 10 minutes (10 minute Natural Release). Then turn the steam release knob to the Venting position to Quick Release the remaining steam/pressure. Set the oven broiler to 350° to start heating up. Use tongs to remove the ribs to a foil lined baking pan. Slather barbecue sauce all over them. Place under a 350° broiler for a few minutes to caramelize the sauce (this step is optional. Sometimes I just sauce them up and eat them). Watch them to make sure they don't burn or get dried out. Serve with a little extra bbq sauce for dipping. Awesome rib recipe. I made them tonight for dinner. Didn’t change a thing. No one run!!!! Yes, though the spice rub may not stick very well. Hi this sounds delish. I want to try. Will 5#’s work in a 6 quart IP? They should, Stack them in an offset pattern. At the very worst you might have to add a minute to the cook time.